Another day, another way to use oats. This one is a more novel usage than yesterday’s rather predictable oatmeal cookies: nuggets! More specifically, chickpea nuggets made with oat flour. This super-simple recipe from the Kitchn relies on aquafaba to bind chickpeas and oat flour together, then incorporates a simple toasted panko coating for a little crunch. I was wary at first; I’ve had plenty of nugget-making experiences where the coating just won’t stick or involves a complicated milk-bath-plus-flour-plus-roll-in-the-coating technique that leaves you with crummy fingers and soggy nuggets. But this method worked out great! Everything came together quickly and with no hassle at all. Plus, because they’re baked, the nuggets won’t fall apart in the frying pan. 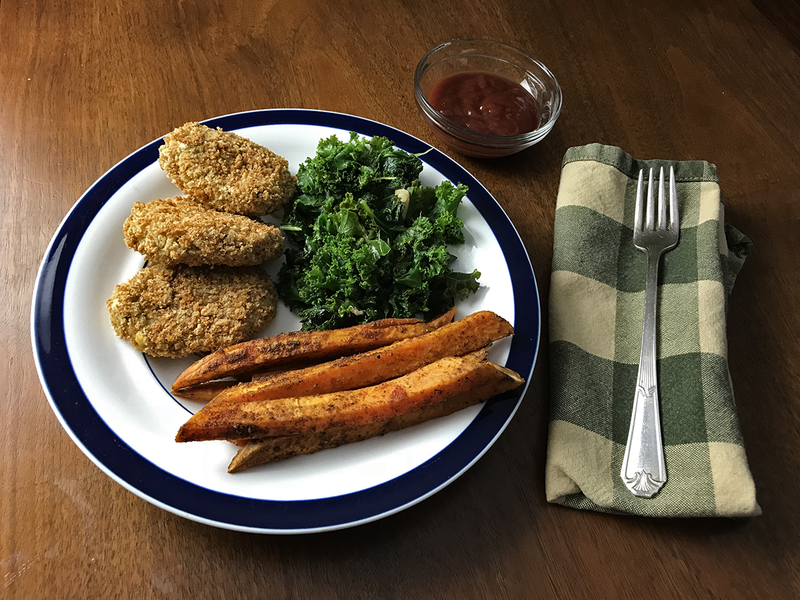 A few reviewers remarked that the nuggets were a bit bland (presumably because this is a kid-focused recipe), so I opted to season mine with a big scoop of Italian seasoning that I’ve probably had for seven years. *insert embarrassed-face emoji here* If anything, my nuggets were a little over seasoned! But not in a bad way. I served them with some homemade baked sweet potato fries and a big pile of sautéed kale. An easy, healthy dinner. So, oat flour-based chickpea nuggets? A total win. What’s your most unexpected use of oats? These sound good! I’m always happy to hear about a nugget/patty that doesn’t fall apart in the pan! Same! Nothing sets me into a fit of flustered irritation like watching my dinner fall apart in the pan. These sound great! It’s been a while since I’ve made chickpea nuggets, so I’ll have to give these a try sometime! I hope you do! I was really surprised at how good they were, for such a simple recipe!